Metso has won orders to deliver dewatering solutions to a customer developing greenfield and brownfield potash projects in Belarus. Metso's deliveries consist of inclined plate settler (IPS) units used for thickening in different applications. The orders are booked in Metso's third-quarter 2018 orders received. "Metso is fully committed to delivering resource- and eco-efficient solutions to our customers. This means maximizing recovery value, while reducing environmental impacts and total cost of operations. We are proud of our customer's continued confidence in our thickening technologies," says Victor Tapia, President of Metso's Mining Equipment business area. The Metso IPS is a modular and compact sedimentation and dewatering system utilizing lamella clarification technology. IPS uses parallel inclined plates to maximize the available settling area. In this way, the size and cost of the gravity settler can be minimized by matching the thickening and clarifying requirements more closely. The solution is easy to maintain and relocate to adapt to process changes. 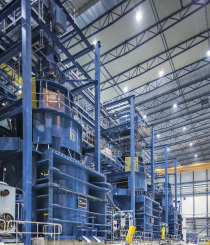 Using parallel inclined plates to minimize floor area occupation, the Metso IPS reduces retention time and lowers installation costs, also enabling greater capacity compared to conventional thickeners. The lamella technology also reduces the environmental impact, thanks to less use of chemicals in the process.